How many times a day can I use the product? 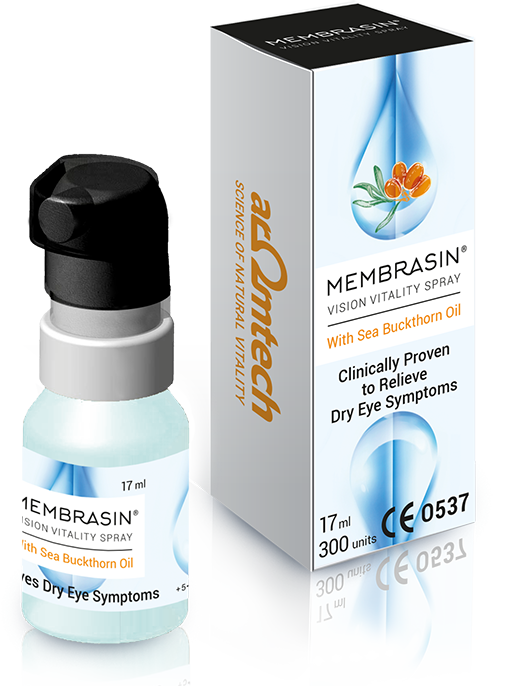 Membrasin Vision -eye spray can be sprayed on closed eyelids several times a day as needed. The recommendation for regular use is 1-2 sprays 1-4 times a day. The bottle is difficult to use and the spray comes out unevenly? The bottle has two-step mechanism. First, press down the dispenser about 2/3 of the way and only after that all the way down. If you try to press in one go it might feel heavy and challenging. Is the product suitable for continuous use? Yes, the product is clinically tested and CE marked for long-term use. How do I best make the spray hit the eyelid when my eyes are closed? After a bit of practice, use becomes easier. It works best when you first press the dispenser down part of the way, then focus on the nozzle, then close your eyes and press the dispenser all the way down, keeping your hand steady. Does the spray also smoothen wrinkles? The spray also has a moisturizing effect on the skin around the eyes. When the skin is hydrated it stays resilient and looks smoother. Is the product suitable for use with makeup? Yes, it is, it doesn’t spoil mascara or foundation. In the clinical tests makeup was allowed to dry for 10 minutes before using the spray. Is the product suitable for use with contact lenses? Yes, it also gives contact lenses some additional hydration without causing blurriness. Does sea buckthorn oil color the eyes? It does not, because the product uses a colorless quality of sea buckthorn oil specifically developed for this purpose. Can the spray be used on children? It can, but the recommended spraying distance of 25 cm should be adhered to. If the child’s eyes are red and there is discharge, this usually indicates an eye infection, which should be treated by a doctor. What if the spray misses the eye? This is not a problem. The product’s ingredients also work as a moisturizer of the skin surrounding the eyes.